shad - Lake Houston Fishing! man it is hard fishing the transition. Here today gone tomorrow. heads. water temp 63 . Water at 63, do you think there's any spawn action right now? 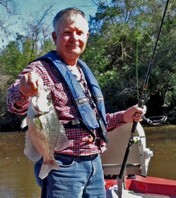 I've heard some crappie will drop eggs in late fall. High 50 to low 60 degree water temp triggers it. have much roe in them. what colors have been workn for ya? red/truse they are down deep. I have caught some white bass that have had semi-soft to nearly fully formed eggs in them in the late fall...but was told that the eggs needed the cold temperatures to 'activate'. If the waters never got cold enough, the fish would either not spawn and reabsorb the eggs, or the eggs would be rendered sterile and the spawn would fail. Maybe it's the same for crappie? People start catching them shallow again in the fall, find some evidence of roe forming and begin a "crappie spawn in the fall too" narrative? ?